The Upper Paleolithic (or Upper Palaeolithic, Late Stone Age) is the third and last subdivision of the Paleolithic or Old Stone Age. Very broadly, it dates to between 50,000 and 10,000 years ago (the beginning of the Holocene), according to some theories coinciding with the appearance of behavioral modernity Humans and before the advent of agriculture. Anatomically modern humans (i.e. Homo sapiens) are believed to have emerged out of Africa around 200,000 years ago, although these lifestyles changed very little from that of archaic humans of the Middle Paleolithic, until about 50,000 years ago, when there was a marked increase in the diversity of artefacts. This period coincides with the expansion of modern humans from Africa throughout Asia and Eurasia, which contributed to the extinction of the Neanderthals. The Upper Paleolithic has the earliest known evidence of organized settlements, in the form of campsites, some with storage pits. Artistic work blossomed, with cave painting, petroglyphs, carvings and engravings on bone or ivory. The first evidence of human fishing is also found, from artefacts in places such as Blombos cave in South Africa. More complex social groupings emerged, supported by more varied and reliable food sources and specialized tool types. This probably contributed to increasing group identification or ethnicity. The peopling of Australia most likely took place before c. 60 ka. Europe was peopled after c. 45 ka. Anatomically modern humans are known to have expanded northward into Siberia as far as the 58th parallel by about 45 ka (Ust'-Ishim man). The Upper Paleolithic is divided by the Last Glacial Maximum (LGM), during about 25 to 15 ka. The peopling of the Americas occurred during this time, with East and Central Asia populations reaching the Bering land bridge after about 35 ka, and expanding into the Americas by about 15 ka. In Western Eurasia, the Paleolithic eases into the so-called Epipaleolithic or Mesolithic from the end of the LGM, beginning 15 ka. The Holocene glacial retreat begins 11.7 ka (10th millennium BC), falling well into the Old World Epipaleolithic, and marking the beginning of the earliest forms of farming in the Fertile Crescent. Both Homo erectus and Neanderthals used the same crude stone tools. Archaeologist Richard G. Klein, who has worked extensively on ancient stone tools, describes the stone tool kit of archaic hominids as impossible to categorize. It was as if the Neanderthals made stone tools, and were not much concerned about their final forms. He argues that almost everywhere, whether Asia, Africa or Europe, before 50,000 years ago all the stone tools are much alike and unsophisticated. Firstly among the artefacts of Africa, archeologists found they could differentiate and classify those of less than 50,000 years into many different categories, such as projectile points, engraving tools, knife blades, and drilling and piercing tools. These new stone-tool types have been described as being distinctly differentiated from each other; each tool had a specific purpose. The invaders, commonly referred to as the Cro-Magnons, left many sophisticated stone tools, carved and engraved pieces on bone, ivory and antler, cave paintings and Venus figurines. The Neanderthals continued to use Mousterian stone tool technology and possibly Chatelperronian technology. These tools disappeared from the archeological record at around the same time the Neanderthals themselves disappeared from the fossil record, about 40,000 cal BP. Settlements were often located in narrow valley bottoms, possibly associated with hunting of passing herds of animals. Some of them may have been occupied year round, though more commonly they appear to have been used seasonally; people moved between the sites to exploit different food sources at different times of the year. Hunting was important, and caribou/wild reindeer "may well be the species of single greatest importance in the entire anthropological literature on hunting." Technological advances included significant developments in flint tool manufacturing, with industries based on fine blades rather than simpler and shorter flakes. 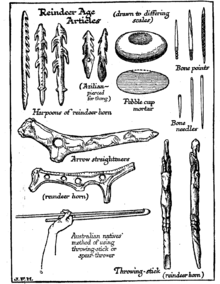 Burins and racloirs were used to work bone, antler and hides. Advanced darts and harpoons also appear in this period, along with the fish hook, the oil lamp, rope, and the eyed needle. The changes in human behavior have been attributed to changes in climate, encompassing a number of global temperature drops. These led to a worsening of the already bitter cold of the last glacial period (popularly but incorrectly called the last ice age). Such changes may have reduced the supply of usable timber and forced people to look at other materials. In addition, flint becomes brittle at low temperatures and may not have functioned as a tool. Some scholars argue that the appearance of complex or abstract language made these behavior changes possible. The complexity of the new human capabilities hints that humans were less capable of planning or foresight before 40,000 years, while the emergence of cooperative and coherent communication marked a new era of cultural development. European LGM refuges, 20,000 BP. The climate of the period in Europe saw dramatic changes, and included the Last Glacial Maximum, the coldest phase of the last glacial period, which lasted from about 26.5 to 19 kya, being coldest at the end, before a relatively rapid warming (all dates vary somewhat for different areas, and in different studies). During the Maximum, most of Northern Europe was covered by an ice-sheet, forcing human populations into the areas known as Last Glacial Maximum refugia, including modern Italy and the Balkans, parts of the Iberian Peninsula and areas around the Black Sea. This period saw cultures such as the Solutrean in France and Spain. Human life may have continued on top of the ice sheet, but we know next to nothing about it, and very little about the human life that preceded the European glaciers. In the early part of the period, up to about 30 kya, the Mousterian Pluvial made northern Africa, including the Sahara, well-watered and with lower temperatures than today; after the end of the Pluvial the Sahara became arid. The Last Glacial Maximum was followed by the Allerød oscillation, a warm and moist global interstadial that occurred around 13.5 to 13.8 kya. Then there was a very rapid onset, perhaps within as little as a decade, of the cold and dry Younger Dryas climate period, giving sub-arctic conditions to much of northern Europe. The Preboreal rise in temperatures also began sharply around 10.3 kya, and by its end around 9.0 kya had brought temperatures nearly to present day levels, although the climate was wetter. This period saw the Upper Paleolithic give way to the start of the following Mesolithic cultural period. As the glaciers receded sea levels rose; the English Channel, Irish Sea and North Sea were land at this time, and the Black Sea a fresh-water lake. In particular the Atlantic coastline was initially far out to sea in modern terms in most areas, though the Mediterranean coastline has retreated far less, except in the north of the Adriatic and the Aegean. The rise in sea levels continued until at least 7.5 kya (5500 BC), so evidence of human activity along Europe's coasts in the Upper Paleolithic is mostly lost, though some traces have been recovered by fishing boats and marine archaeology, especially from Doggerland, the lost area beneath the North Sea. Map of findings of Upper Paleolithic art in Europe. Numerous Aboriginal stone tools were found in gravel sediments in Castlereagh, Sydney, Australia. At first when these results were new they were controversial; more recently dating of the same strata has revised and corroborated these dates. Start of the Mousterian Pluvial in North Africa. Earliest evidence of modern humans found in Europe, in Southern Italy. Ornaments and skeletal remains of modern humans, at Ksar Akil in Lebanon,. First human inhabitants in Perth, Australia, as evidenced by archaeological findings on the Upper Swan River. During this time period, Melbourne, Australia was occupied by hunter-gatherers. 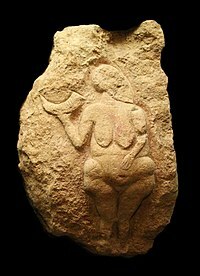 Early cultural centre in the Swabian Alps, earliest figurative art (Venus of Hohle Fels), beginning of the Aurignacian. The first flutes appear in Germany. Löwenmensch figure created in Hohlenstein-Stadel. It is now in Ulmer Museum, Ulm, Germany. 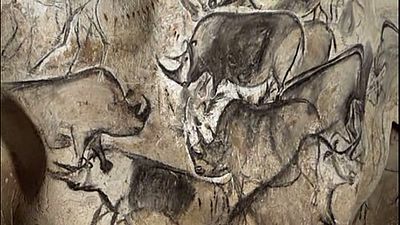 Wall painting with horses, rhinoceroses and aurochs is made at Chauvet Cave, Vallon-Pont-d'Arc, Ardéche gorge, France. Discovered in December 1994. Archaeological studies support human presence in the Chek Lap Kok area (now Hong Kong International Airport) from 35,000 to 39,000 years ago. Zar, Yataghyeri, Damjili and Taghlar caves in Azerbaijan. First evidence of people inhabiting Japan. Kostenki XVII, a layer of the Kostenki (Kostyonki) site, on the middle Don River, was occupied by the early upper paleolithic Spitsyn culture. First ground stone tools appear in Japan. End of the Mousterian Pluvial in North Africa. The area of Sydney was occupied by Aboriginal Australians during this time period, as evidenced by radiocarbon dating. In an archaeological dig in Parramatta, Western Sydney, it was found that the Aboriginals used charcoal, stone tools and possible ancient campfires. First human settlement in Alice Springs, Northern Territory, Australia. Last eruption of the Ciomadul volcano in Romania. Venus of Dolní Věstonice (Czech Republic). It is the oldest known ceramic in the world. The Red Lady of Paviland lived around 29,000–26,000 years ago. Recent evidence has come to light that he was a tribal chief. Human settlement in Beijing, China dates from about 27,000 to 10,000 years ago. Start of the second Mousterian Pluvial in North Africa. Venus of Petřkovice is created at Petřkovice in Ostrava, Czech Republic. It is now in Archeological Institute, Brno. Last Glacial Maximum: Venus of Brassempouy, Grotte du Pape, Brassempouy, Landes, France, created. It is now at Musée des Antiquités Nationales, Saint-Germain-en-Laye. Venus of Willendorf, Austria, created. It is now at the Natural History Museum, Vienna. Artifacts suggests early human activity occurred at some point in Canberra, Australia. Archaeological evidence of settlement in the region includes inhabited rock shelters, rock art, burial places, camps and quarry sites, and stone tools and arrangements. End of the second Mousterian Pluvial in North Africa. Last Glacial Maximum. Mean sea levels are believed to be 110 to 120 metres (360 to 390 ft) lower than present, with the direct implication that many coastal and lower riverine valley archaeological sites of interest are today under water. Spotted Horses, Pech Merle cave, Dordogne, France are painted. Discovered in December, 1994. Ibex-headed spear-thrower, from Le Mas-d'Azil, Ariège, France, is made. It is now at Musée de la Préhistoire, Le Mas d'Azil. Mammoth-bone village in Mezhyrich, Ukraine is inhabited. Spotted human hands are painted at Pech Merle cave, Dordogne, France. Discovered in December 1994. Hall of Bulls at Lascaux in France is painted. Discovered in 1940. Closed to the public in 1963. Bird-Headed man with bison and Rhinoceros, Lascaux, is painted. Lamp with ibex design, from La Mouthe cave, Dordogne, France, is made. It is now at Musée des Antiquités Nationales, Saint-Germain-en-Laye. Paintings in Cosquer Cave are made, where the cave mouth is now under water at Cap Margiou, France. Bison, Le Tuc d'Audoubert, Ariège, France. Paleo-Indians move across North America, then southward through Central America. Pregnant woman and deer (? ), from Laugerie-Basse, France was made. It is now at Musée des Antiquités Nationales, St.-Germain-en-Laye. Older Dryas stadial, Allerød interstadial. Paleo-Indians searched for big game near what is now the Hovenweep National Monument. The Swimming Reindeer, created 13,000 years ago. Beginning of the Holocene extinction. Wooden buildings in South America (Chile). First evidence of human settlement in Argentina. The Arlington Springs Man dies on the island of Santa Rosa, off the coast of California, United States. Human remains deposited in caves which are now located off the coast of Yucatán, Mexico. Creswellian culture settlement on Hengistbury Head, England, dates from around this year. Evidence of a massacre near Lake Turkana, Kenya indicates upper paleolithic warfare. The Châtelperronian culture was located around central and south western France, and northern Spain. It appears to be derived from the Mousterian culture, and represents the period of overlap between Neanderthals and Homo sapiens. This culture lasted from approximately 45,000 BP to 40,000 BP. The Aurignacian culture was located in Europe and south west Asia, and flourished between 43,000 and 36,000 BP. It may have been contemporary with the Périgordian (a contested grouping of the earlier Châtelperronian and later Gravettian cultures). The Gravettian culture was located across Europe. Gravettian sites generally date between 33,000 and 20,000 BP. The Solutrean culture was located in eastern France, Spain, and England. Solutrean artifacts have been dated c. 22,000 to 17,000 BP. The Magdalenian culture left evidence from Portugal to Poland during the period from 17,000 to 12,000 BP. 33,000 BP, Gravettian culture in southern Ukraine. ^ Rightmire, GP (2009). "Out of Africa: modern human origins special feature: middle and later Pleistocene hominids in Africa and Southwest Asia". Proc Natl Acad Sci USA. 106 (38): 16046–50. Bibcode:2009PNAS..10616046R. doi:10.1073/pnas.0903930106. PMC 2752549. PMID 19581595. ^ "Klein: Behavioral and Biological Origins of Modern Humans 3 of 3". www.accessexcellence.org. ^ "Klein: Behavioral and Biological Origins of Modern Humans 1 of 3". www.accessexcellence.org. ^ a b Higham, Tom; Douka, Katerina; Wood, Rachel; Ramsey, Christopher Bronk; Brock, Fiona; Basell, Laura; Camps, Marta; Arrizabalaga, Alvaro; Baena, Javier; Barroso-Ruíz, Cecillio; Bergman, Christopher; Boitard, Coralie; Boscato, Paolo; Caparrós, Miguel; Conard, Nicholas J.; Draily, Christelle; Froment, Alain; Galván, Bertila; Gambassini, Paolo; Garcia-Moreno, Alejandro; Grimaldi, Stefano; Haesaerts, Paul; Holt, Brigitte; Iriarte-Chiapusso, Maria-Jose; Jelinek, Arthur; Jordá Pardo, Jesús F.; Maíllo-Fernández, José-Manuel; Marom, Anat; Maroto, Julià; Menéndez, Mario; Metz, Laure; Morin, Eugène; Moroni, Adriana; Negrino, Fabio; Panagopoulou, Eleni; Peresani, Marco; Pirson, Stéphane; de la Rasilla, Marco; Riel-Salvatore, Julien; Ronchitelli, Annamaria; Santamaria, David; Semal, Patrick; Slimak, Ludovic; Soler, Joaquim; Soler, Narcís; Villaluenga, Aritza; Pinhasi, Ron; Jacobi, Roger (21 August 2014). "The timing and spatiotemporal patterning of Neanderthal disappearance". Nature. 512 (7514): 306–309. Bibcode:2014Natur.512..306H. doi:10.1038/nature13621. PMID 25143113. ^ Attenbrow, Val (2010). Sydney's Aboriginal Past: Investigating the Archaeological and Historical Records. Sydney: UNSW Press. pp. 152–153. ISBN 978-1-74223-116-7. Retrieved 11 Nov 2013. ^ Stockton, Eugene D.; Nanson, Gerald C. (April 2004). "Cranebrook Terrace Revisited". Archaeology in Oceania. 39 (1): 59–60. doi:10.1002/j.1834-4453.2004.tb00560.x. JSTOR 40387277. ^ Wilford, John Noble (2 November 2011). "Fossil Teeth Put Humans in Europe Earlier Than Thought". The New York Times. ^ Sandra Bowdler. "The Pleistocene Pacific". Published in 'Human settlement', in D. Denoon (ed) The Cambridge History of the Pacific Islanders. pp. 41–50. Cambridge University Press, Cambridge. University of Western Australia. Archived from the original on 16 February 2008. Retrieved 26 February 2008. ^ Gary Presland, The First Residents of Melbourne's Western Region, (revised edition), Harriland Press, 1997. ISBN 0-646-33150-7. Presland says on page 1: "There is some evidence to show that people were living in the Maribyrnong River valley, near present day Keilor, about 40,000 years ago." ^ "Humans killed off Australia's giant beasts". BBC News. 24 March 2012. ^ "The Trial Excavation at the Archaeological Site of Wong Tei Tung, Sham Chung, Hong Kong SAR". Hong Kong Archaeological Society. January 2006. Archived from the original on 3 March 2009. Retrieved 21 August 2010. ^ Aboriginal Australia Art & Culture Centre. "Arrernte Aboriginal Art and Culture Centre Alice Springs". Aboriginalart.com.au. Archived from the original on 24 May 2011. Retrieved 30 May 2011. ^ "The Peking Man World Heritage Site at Zhoukoudian". 2014-11-14. ^ Gillespie, Lyall (1984). Aborigines of the Canberra Region. Canberra: Wizard (Lyall Gillespie). pp. 1–25. ISBN 978-0-9590255-0-7. ^ "Divers find traces of ancient Americans". 9 September 2004. ^ M. Mirazón Lahr et al., "Inter-group violence among early Holocene hunter-gatherers of West Turkana, Kenya", Nature 529, 394–398 (21 January 2016), doi:10.1038/nature16477. "Here we report on a case of inter-group violence towards a group of hunter-gatherers from Nataruk, west of Lake Turkana [...] Ten of the twelve articulated skeletons found at Nataruk show evidence of having died violently at the edge of a lagoon, into which some of the bodies fell. The remains [...] offer a rare glimpse into the life and death of past foraging people, and evidence that warfare was part of the repertoire of inter-group relations among prehistoric hunter-gatherers." "Evidence of a prehistoric massacre extends the history of warfare". University of Cambridge. 20 Jan 2016. Retrieved 20 Mar 2017. . For early depiction of interpersonal violence in rock art see: Taçon, Paul; Chippindale, Christopher (October 1994). "Australia's Ancient Warriors: Changing Depictions of Fighting in the Rock Art of Arnhem Land, N.T.". Cambridge Archaeological Journal. 4 (2): 211–48. doi:10.1017/S0959774300001086. .
^ Gary Presland, Aboriginal Melbourne: The Lost Land of the Kulin People, Harriland Press (1985), Second edition 1994, ISBN 0-9577004-2-3. This book describes in some detail the archaeological evidence regarding aboriginal life, culture, food gathering and land management, particularly the period from the flooding of Bass Strait and Port Phillip from about 7–10,000 years ago, up to the European colonisation in the nineteenth century. ^ Dousset, Laurent (2005). "Daruk". AusAnthrop Australian Aboriginal tribal database. Archived from the original on April 9, 2011. Retrieved 27 August 2012. ^ "Aboriginal people and place". Sydney Barani. 2013. Retrieved 5 July 2014. ^ Thorley, Peter (2004). "Rock-art and the archaeological record of Indigenous settlement in Central Australia". Australian Aboriginal Studies (1). Retrieved 18 June 2011.